Several years ago at Melbourne Museum I saw A Day in Pompeii, a spectacular and moving exhibition that used a wide variety of artefacts to conjure a sense of commonality with the people of the ancient Roman town. The exhibition culminated in a darkened room at whose centre lay the famous body casts of those buried beneath the ash of Vesuvius. A grim enough sight in themselves, the casts were all the more disturbing given the museum’s success in making the fate of Pompeii’s victims so relatable. It was in anticipation of similar emotions that I approached Another Day in Paradise, Campbelltown Arts Centre’s survey show of paintings from the all-too-brief career of Bali Nine prisoner Myuran Sukumaran. 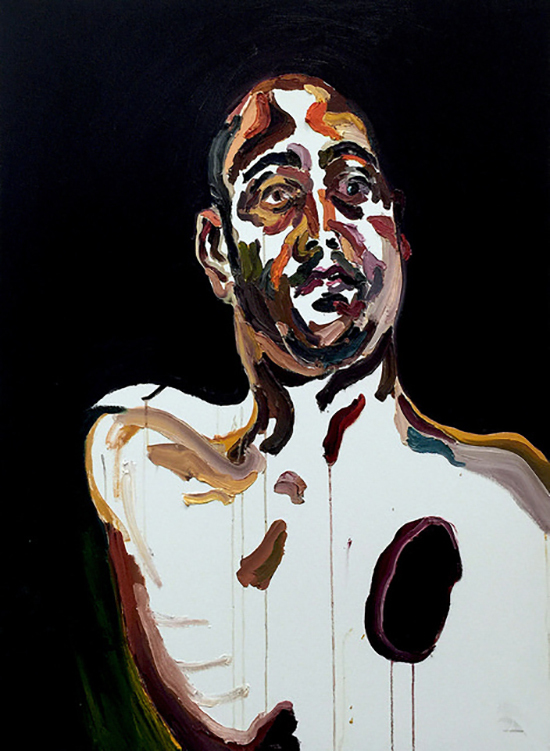 Sukumaran began painting in earnest in 2012 under the guidance of Australian artist Ben Quilty, whom he approached for lessons through his lawyer, seven years into his prison sentence. The two became friends and Quilty co-curated this exhibition with CAC Director Michael Dagostino. 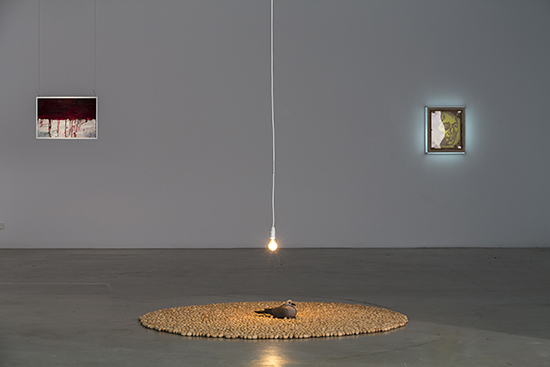 With the exception of one small room showing Australian landscapes, the entire exhibition space is devoted to Sukumaran’s impassioned output in the years, days and hours leading up to his execution on 29 April 2015. Shown alongside Sukumaran’s paintings are commissioned works by six contemporary Australian artists that respond to the issues at hand: capital punishment, systems of justice, incarceration, dehumanisation, prejudice, death. But Sukumaran’s bold paintings predominate. Arranged thematically and to some extent chronologically, the exhibition begins in the foyer with a scene-setting row of portraits of the Bali Nine—those nine Australians infamously arrested in 2005 in Bali on suspicion of attempting to smuggle eight kilograms of heroin out of Indonesia. Painted in 2013, these depictions of Andrew Chan, Scott Rush, Si Yi Chen, Michael Czugaj, Matt Norman, Martin Stephens, Tan Duc Thanh Nguyen, Renae Lawrence and Sukumaran himself date from the beginning of the artist’s tutelage by Quilty but already show assurance, capturing the immediacy and directness of the newspaper montages Sukumaran initially used as a reference. The heads of Sukumaran and Chan are sculpturally rendered with a pleasing solidity, while a broader approach is taken to their fellow inmates, with choppy brushstrokes and the application of bright, unmixed white, especially visible in Czugaj’s toothy smile. Around the corner there are four landscapes. Two of these show nightmarish abstracted imaginings of Nusa Kambangan, the prison island where most of Indonesia’s executions are carried out. They have a striking dynamism and ominousness, but it’s the human condition as explored through portraits that preoccupies Sukumaran, and the following rooms are full of works in this vein. Lining two walls of a room devoted to images of prison life are portraits of fellow inmates and guards, interspersed with the occasional pig’s head from the Balinese prisoners’ yearly feast, all painted from life—one of the most challenging exercises in a technical sense. Here you see an artist still working things out in terms of technique, experimenting with different stylistic approaches, grappling with anatomy and foreshortening, occasionally scrubbing off paint to correct a mistake. Sukumaran shows himself to be a natural portraitist in these works, and obsessively dedicated. His sitters display dignity, solemnity and that very particular resigned expression that results from long sittings. Individuality emerges from dense agglomerations of impasto brushstrokes or, occasionally, from a more angular, Matisse-like approach. In one painting, Sukumaran sketches in the outline of his subject’s shirt collar with a single green brushstroke, something which confuses a couple of viewers, who mistake it for a noose. In this same room, one of the exhibition’s commissioned artworks is installed—an imposing three-channel video work, Tsomi, wan bel (Sorry, win-win situation) by Taloi Havini, showing aspects of a restorative (community) justice ritual in northern Bougainville. Mostly unsubtitled, the video loop is dominated by simultaneous close-ups of a young woman, a young man and a female tribal elder, all of whom gaze out at the viewer and by implication each other. The extreme clarity of the footage shows such subtle expressions that, even without understanding the sparse conversation, it’s almost certain who is guilty and who accuses. These faces form an interesting counterpart to Sukumaran’s many portrait heads on the adjacent walls, and transfix gallery visitors. In the gallery’s largest space, Sukumaran’s numerous self-portraits are hung salon-style. Taking on a shrine-like aspect, they are interspersed with paintings of relics of capital punishment—execution crosses, bullets—and on its own, on the right-hand wall, an AK47. Here again Sukumaran experiments with different approaches. Some self-portraits are sketchy and linear, others very modelled, still others displaying Quilty’s signature robust impasto and colour palette. There are elements of Francis Bacon in the paint drips, the scrubbing out of features, the truncation of seated bodies through a curvilinear shorthand. Whether by chance or design, there’s a Mannerist fervour to many of these self-depictions, the artist’s eyes raised in El Greco-esque torment. 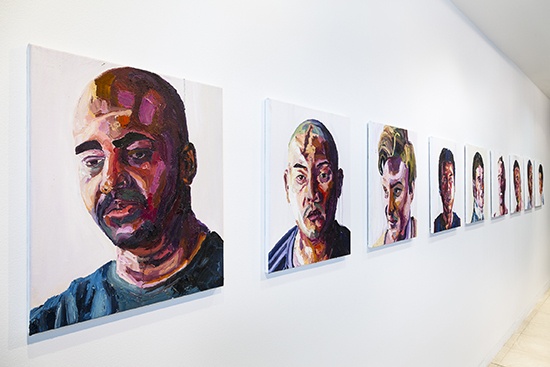 Adjacent to the self-portrait wall are 12 paintings from Sukumaran’s final 72 hours of life. The context is staggering. As someone who shares Sukumaran’s commitment to painting, I can’t help but wonder, would I be compelled to paint or draw so close to execution? Or would I be paralysed? These works are urgent, despairing, yet transcendent. They rise above cruelty and annihilation. They are incredibly courageous. The final painting, exhibited in a smaller room, is of a bloody Indonesian flag. A gesture of defiance, it was signed by the nine prisoners due to face the firing squad that night (Filipina Mary Jane Veloso was to be granted an 11th hour reprieve). Suspended from the ceiling so both sides are visible, it’s a difficult object to contemplate with its pathetically upbeat messages around the familiar Windsor & Newton label on the back. Positioned nearby, Abdul-Rahman Abdullah’s hyper-realistic sculpture of a dove sitting at the centre of an immense circle of eggs, The Days, pays quiet tribute to the 3,665 days Sukumaran’s loved ones endured from the time of his incarceration until his death. 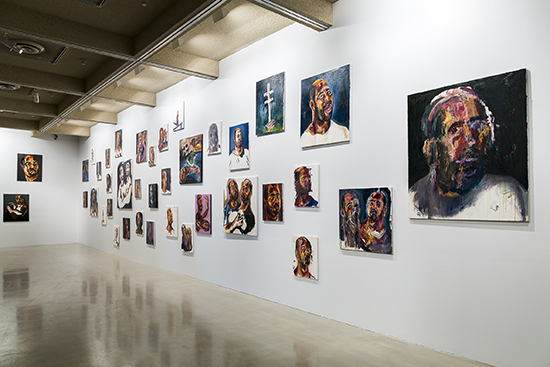 There’s a noticeable contrast between the powerful rawness of Sukumaran’s paintings and the highly finished sculptural or video installations produced by the commissioned artists, which really function as a sort of parallel exhibition requiring a different, less visceral mode of appreciation (the exception is Matthew Sleeth’s intense video double-portrait of Sukumaran and Andrew Chan). This ensures Sukumaran’s paintings aren’t obscured by similar work, but it does mean regularly switching between two discrete modes of viewing as you move through the gallery. The circumstances surrounding Another Day in Paradise are undeniably bleak, but in contrast with the Pompeii exhibition, my parting impression is not one of sadness. The artist’s presence is too vital—in his self-portraits, in his passionate commitment to his artform, in his sheer creative output—for me to see the exhibition as anything other than life-affirming.